Opponents of the death penalty condemn China's record on a number of fronts. Firstly, there is the secrecy surrounding the judicial process that makes it impossible to find out whether the accused has had a fair trial or not. That means of course that it is uncertain how many criminals are executed here. Human rights groups based abroad estimate that China executes more people each year than the rest of the world put together - although there is quite a disparity between their figures. It will be around 5,000 in 2009, down from 6,000 in 2007, according to the US-based Dui Hua Foundation. Amnesty International's figure is lower. It estimates the number of executions in 2008 was about 1,700, still a considerable number. The disparity shows just how little is known about the process here. 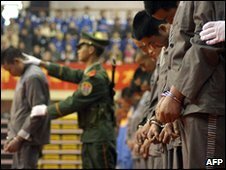 Reports in the Chinese media suggest about one in 10 executions is for non-violent, economic crimes. The US government, in its most recent annual report on human rights in China, said there were at least 68 capital offences in China's criminal code. Then there are objections to the way the sentence is carried out. In much of China, prisoners are killed with a gunshot to the head. Gradually, more and more provinces and municipalities are replacing this method with lethal injection, but the facilities to offer this alternative are not available everywhere yet. Within China, according to a commentary this month in the Southern Weekend written by legal scholar Chen Guangzhong, "most of the public and members of the legal community basically accept and support China's current policy toward the death penalty". But Mr Chen questioned whether the insistence on secrecy was causing more harm than good because it eroded people's confidence in the way the sentence was handed down and carried out. "The way that death penalty policies are implemented ought to be an important subject for public oversight," he said. The courts here describe themselves as independent, but the reality is the Communist Party controls them. in its reduction of the use of capital punishment". Two years ago China changed the rules to give the Supreme People's Court final say over whether a death sentence is carried out or not. Before that it was lower courts that had the final say. Dui Hua believes the number of people executed fell by at least a quarter in the year after the reforms were introduced. A court spokesman, quoted in the US government human rights report, suggested that since then the court had rejected 15% of the cases it had reviewed, due, the report said, to "unclear facts, insufficient evidence, inappropriateness of the death sentence in some cases and inadequate trial procedures". What has made the case of Akmal Shaikh so unusual is that he was the first European national to be convicted of a capital crime in half a century. His supporters have complained that the court did not take into account Mr Shaikh's mental illness - his family says he suffers from bipolar disorder and was delusional when he arrived in China. China's criminal code does acknowledge that those suffering from mental disorders should not be held responsible for their actions. But the concern in this case is that a judicial system that carries out its deliberation behind closed doors cannot guarantee that Mr Shaikh's condition has been accurately considered. A spokesman for the Chinese embassy in London has pointed out that under Chinese law anyone found with 50g of heroin can be executed. Mr Shaikh was found with 4kg. This was an extremely serious offence. British Prime Minister Gordon Brown nonetheless appealed for clemency on behalf of Mr Shaikh. Chinese diplomats listened, but granting the request might have looked like an acknowledgement that the proper procedures in this case had not been followed - and China does not welcome or encourage foreign scrutiny of its judicial process which it regards as very much an internal affair.